Bloemfontein, the City of Roses, serves as something of an oasis, lying as it does plum in the middle of the Free State and indeed the country. The only major city for miles around, it is also the sixth largest city in the country, the Judicial Capital of South Africa, and it lies on the N1 between Johannesburg and Cape Town, often functioning as a stop off to break the major journey between the two cities. Despite being situated in an area of dry grassland, Bloemfontein more than lives up to its name - spring of flowers. Thousands of rose bushes line the city; more than 4000 rose trees have been planted in the rose gardens in Kings Park, and many homes, still minus the ubiquitous six metre wall of other major cities in South Africa, boast colourful gardens littered with flowering plants and trees. Bloemies, as the locals fondly call her it, is a city of little stress and very few residents buy into the rush, rush syndrome typical of a major city. The city centre is lined with historical buildings, including the beautiful tree-lined President Brand Street - a national monument - its pavements home to several graceful museum buildings, right in the centre of the CBD. Naval Hill, a little nature reserve of 192 odd hectares, set right in the city, is worth a drive through. Set on a hill as it is, it not only provides a welcome respite from all things city, but also gives a bird’s eye view over the city. And the extremely modern Orchid House, which lies at the western foot of Naval Hill in Hamilton Park, lays claim to the world’s largest collection of orchids. There is also a fragrance garden for the blind close to Orchid House. 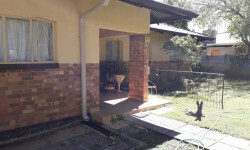 For holiday makers (or even those stopping off here on business trips), accommodation in Bloemfontein is plentiful. Hotels and B&B's abound and those who prefer to self cater will find that a stay in Bloemfontein is reasonably priced and accompanied by true South African hospitality. 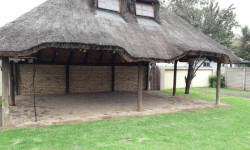 70 Kellner street, Westdene, Bloemfontein, Free State, 9300.